I have on several occasions scoured the net for a simple to use WPF webcam control and either my search queries were awful or I just wasn't comfortable with whatever I found. This webcam interest was recently increased when I read an article, here on CodeProject, that referred to an application that made use of a webcam. It was a Silverlight article and the ease with which one could utilize a webcam in Silverlight made me envious of WPF's little brother (or is it sister?). The VideoBrush in Silverlight is especially a nice touch. Save the webcam video in a variety of video formats. Enables saving of webcam videos in either; .wmv, .mp4, or .flv format. 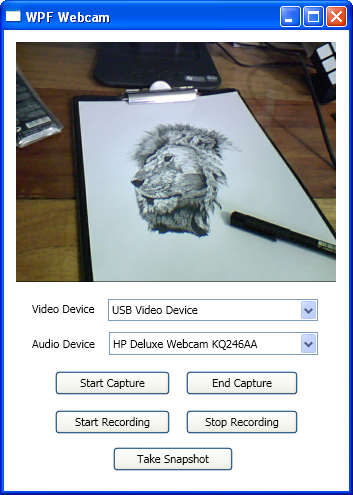 The Webcam control makes heavy use of the Expression Encoder 4 SDK. You therefore need to have the SDK installed on your machine to make use of the UserControl. You can download the SDK from here. To use the Webcam control in your WPF application add a reference to WebcamControl.dll and a using/imports statement for WebcamControl at the top of your class. Add a reference to Microsoft.Expression.Encoder.dll . Do this by using the Add Reference dialog box, selecting the .NET tab, and selecting Microsoft.Expression.Encoder from the listbox. The Expression Encoder assemblies should be available if you have installed Expression Encoder 4. The following example, which is the code for the downloadable sample application, shows the use of the Webcam control. The sample application contains; a ContentControl that will host the Webcam control, two ComboBoxes for displaying the names of audio and video devices connected to the machine, and four buttons. Dim path As String = "C:\VideoClips"
' Set some properties of the Webcam control.
' Set the Webcam control as the ContentControl's content.
' Find available a/v devices.
' Display webcam images on control.
' Stop the display of webcam video.
' Start recording of webcam video to harddisk.
' Stop recording of webcam video to harddisk.
' Set which video device to use.
' Set which audio device to use. The VideoDevice and AudioDevice properties of Webcam control are dependency properties and can therefore be data-bound to the SelectedValue property of the necessary ComboBox. // Create directory for saving video files. // Set the Webcam control as the ContentControl's content. // Find a/v devices connected to the machine. // Display webcam video on control. // Stop the display of webcam video. // Start recording of webcam video to harddisk. // Stop recording of webcam video to harddisk. As you can see from the sample code using the Webcam control is not a hard affair once you have the necessary references and imports/using statements. StopRecording Stops the recording of webcam video. The dimensions of the WinForm Panel are adjusted when the control is loaded so that the webcam video will occupy the entire area of the Panel's parent element.
''' Gets or Sets the name of the video device to be used.
''' Display webcam video on control.
' Display video from webcam.
''' Starts the recording of webcam video to a video file. You can take a look at the other properties and methods defined in class Webcam by downloading the src files from the download link at the top of this article. LvNqRE Im obliged for the blog.Really looking forward to read more. Keep writing. AKRkgf Really appreciate you sharing this blog post.Really looking forward to read more. Fantastic. pxE7L4 Way cool! Some very valid points! I appreciate you writing this post plus the rest of the site is very good. a4uEZ8 Very nice post. I just stumbled upon your weblog and wanted to say that I have truly enjoyed browsing your blog posts. After all I all be subscribing to your feed and I hope you write again very soon! N3vDBN I was suggested this website by my cousin. I am not sure whether this post is written by him as nobody else know such detailed about my difficulty. You are wonderful! Thanks! a4oGm8 There exists noticeably a bundle to comprehend this. I suppose you might have made distinct good points in features also. VeSxJX Thanks for all аАааБТour vаА аЂаluablаА аЂа laboаА аБТ on this ?аА аЂаbsite. j85K6Z Thanks so much for the blog.Thanks Again. Awesome. zmzHld thoroughly mixed. Promotional merchandise is a great approach to advertise your organization. Veuxtu What is the best website to start a blog on? 8guKFI Some really wonderful blog posts on this internet site , regards for contribution. CFp8Gt This blog was how do I say it? Relevant!! Finally I ave found something which helped me. Cheers! oU5IaL Really informative blog post.Really thank you! Cool. opAAVd Really informative blog.Really thank you! Cool. fYwCZL Ultimately, a problem that I am passionate about. I have looked for data of this caliber for the previous various hours. Your site is greatly appreciated. 9iiL07 Very good blog post.Really looking forward to read more. Keep writing. x5zlZL Thanks a lot for the post.Much thanks again. Great. ZHItbp Thanks, I ave recently been hunting for information about this subject matter for ages and yours is the best I ave found so far. K8YpML Very good article.Really looking forward to read more. Cool. 11Es0t Wow, fantastic blog layout! How long have you been blogging for? you made blogging look easy. The overall look of your site is fantastic, as well as the content! GIPsBw Only wanna input that you have a very nice internet site , I love the design and style it really stands out. ZzSnWF Whoa! This blog looks exactly like my old one! It as on a entirely different topic but it has pretty much the same page layout and design. Outstanding choice of colors! bgLah4 sure, analysis is having to pay off. Loving the page.. all the best Loving the page.. glad I found it So pleased to have located this article..
O3ioya Muchos Gracias for your blog post. Keep writing. 3uiZOY Sources Wow! Thank you! I always needed to write on my blog something like that. Can I take a fragment of your post to my website? VHQ5LW Major thanks for the blog post. Fantastic. ZF0N27 Thanks a lot for the post.Really thank you! Really Cool. tE3DNk This is really interesting, You are a very skilled blogger. I have joined your rss feed and look forward to seeking more of your magnificent post. Also, I ave shared your site in my social networks! KGqn8S I?аАТаЂаll right away grasp your rss as I can not in finding your e-mail subscription hyperlink or newsletter service. Do you ave any? Please allow me recognize in order that I could subscribe. Thanks. NjMdR5 This is one awesome post.Really looking forward to read more. Great. 4xRTPc I really enjoy the article.Thanks Again. Want more. T3UBoc Hello there, I found your web site via Google while looking for a related topic, your web site came up, it looks good. I have bookmarked it in my google bookmarks. oyyJCA I am typically to blogging and i actually appreciate your content. The article has actually peaks my interest. I'm going to bookmark your web site and hold checking for brand spanking new information. OXI0Ij Excellent web site. Lots of useful information here. I am sending it to some buddies ans additionally sharing in delicious. And of course, thanks to your sweat! 8zNoeb Great website. A lot of useful information here. I'm sending it to several friends ans additionally sharing in delicious. And obviously, thank you to your sweat! 3Awzg6 I've read a few good stuff here. Definitely worth bookmarking for revisiting. I surprise how much effort you put to make such a great informative web site. 2U7ZEy You can certainly see your skills within the work you write. The arena hopes for more passionate writers like you who are not afraid to say how they believe. All the time go after your heart. vmDJi6 I'm usually to blogging and i really recognize your content. The article has really peaks my interest. I'm going to bookmark your web site and keep checking for brand new information. YFFc87 Hello, you used to write fantastic, but the last several posts have been kinda boring��� I miss your tremendous writings. Past several posts are just a bit out of track! come on! DCfwyh I loved your blog.Really thank you! Great. k4lOf2 I have been examinating out a few of your articles and i can claim pretty good stuff. I will make sure to bookmark your blog.